Memorial Day Weekend in the States is also a bank holiday weekend here in England, so we had planned a getaway to the English countryside, from Friday to Monday. 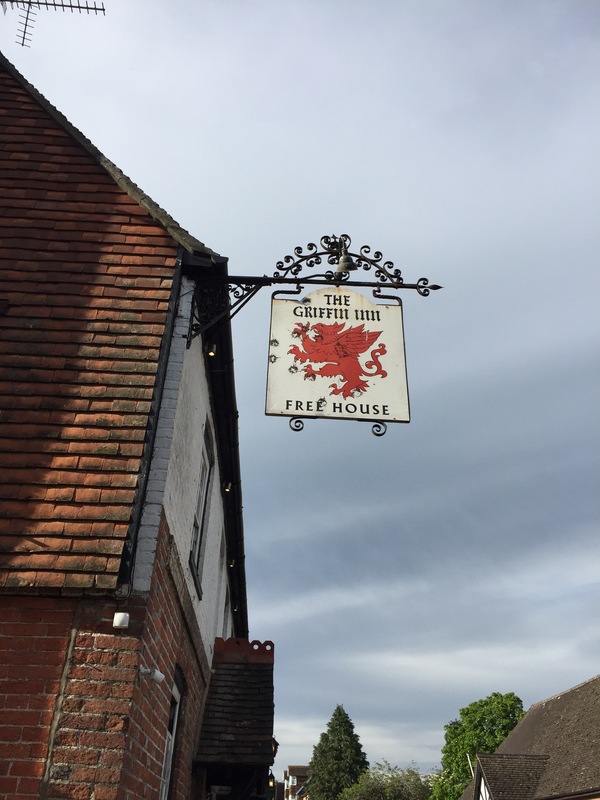 One of M’s business associates had recommended the Griffin Inn to him as a family- and dog-friendly place to stay. He told us to ask for the room over the pub, so the baby monitor reaches down there. Good tip! Well, it was new in the year 1086 anyway, when it received the moniker, set aside by William the Conquerer as hunting ground. Easter weekend in England is a long holiday weekend—everyone gets Good Friday and Easter Monday off—so we decided it was a good time to plan a getaway, even though we’d just gotten back from a two-week trip to Virginia, Maryland, and New Jersey merely four days before. We decided on the New Forest as our holiday destination, which is just about an hour and a half or so from London by car. This was our first trip within England as a family of four, and also the first time M tried driving on the left side of the road. I was quite a bit nervous about that (though I would have been much more nervous if I was the one driving! ), especially since he opted for a manual car, which requires shifting with the left hand. Definitely not second nature to do it with the non-dominant hand! But renting an automatic car is much, much more expensive, so he took the risk. He ended up doing fine. We also had to navigate foreign roads (lots of roundabouts) and decipher what the signs and lines painted on the roads mean, but we made it! We have a UK carseat for Baby R, but we don’t have one for E. She’s fine to sit in a taxi without a carseat, and we really don’t take one that often. But one of our neighbours told us about this clever invention, the Trunki Boostapak, which is a backpack that turns into a booster seat for a child, so you don’t have to worry about not having a carseat. So brilliant! We had to google what the fields of yellow flowers we kept passing were. Rapeseed, apparently, used to make rapeseed oil. Which we later dipped our bread in at dinner. Our destination was New Park Manor, one of the eight properties in the Luxury Family Hotels group. These places are incredible. They are amazing old buildings (like manor houses, hunting lodges, and even a castle!) converted into family-friendly hotels. And when I say family-friendly, I mean specifically catering to people with young kids and babies. (If you don’t have young kids, you don’t have any business being there.) They’ve thought of nearly everything. You can leave the kids in the crèche for a two-hour session each day; there’s a game/cinema room, and play sets and toys in the garden; daily activities for kids; bicycles and bike seats for all ages; a family dining room with a big children’s menu; and a baby-listening service, which is essentially a baby monitor in your room so you can put the kids to bed and then go down to the adult dining room and have a nice dinner. They even provide things like a bottle-sterilizing service and offer to puree anything into baby food. And a TV in the tub, what a treat! Oh, and they’re dog friendly, too, so Wren got to come along! We arrived a bit later than planned, and had the children booked into the 3-5 p.m. session of the creche, so we dropped them off first thing. I was concerned that E wouldn’t want us to leave her there, but she was actually fine! It looks like a big, friendly nursery school room, with lots of nice people leading the kids in craft projects and activities, and lots of toys, of course. Both girls did great. All weekend E kept asking when it would be time to go to the “kids’ club”—she loved it! Our room was small for the two of us adults, E on a futon-type bed, R in a travel cot (Pack’n’Play, provided by the hotel), and the dog. It was quite tight. But there was an elephant made of towels on E’s bed, a changing pad and nappy bin for R, cookies on a plate with the girls’ names by them, a pillow and bowl for Wren, and ponies grazing out our window! More than 5,000 ponies roam free in the New Forest. They’re considered wild, but what they really are is free-roaming. They’re technically owned by local people known as “commoners,” who have often owned several generations of the same family. There are also cows and pigs, but I’m not sure how many. We didn’t see many cows or any pigs. The ponies are everywhere, though. They’re called the “architects of the forest,” because their grazing is what makes the forest look the way it does. While the kids were in the crèche, we relaxed in the lounge with a drink. How civilized! We all had dinner together that night in the family dining room. Our table was all set up with a highchair for R, kids’ utensils, and a dish of hummus and dippers set out as a kids’ appetizer. Dogs aren’t allowed in the dining rooms, but they are happy to dogsit at the reception area just outside it, which was nice. On Saturday, we had the girls booked into the creche for the morning session, so after a nice breakfast (we were able to have it in the lounge so Wren could join us—she even got her own order of bacon, best holiday ever) and a bit of playtime outside in the garden, we dropped them off and then had two hours of free time! I went for a run with the dog, and M just relaxed in the room. That afternoon, we went into the picturesque village of Lyndhurst for lunch, then set out for Hurst Castle, which is an old military fortress on the sea, built by Henry VIII (completed in 1544). 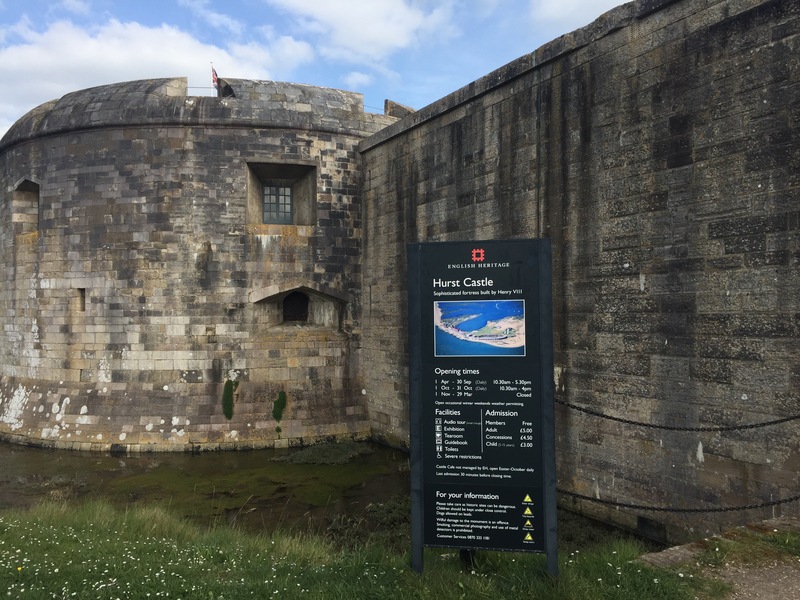 It later served as a prison for King Charles I, and was manned during WWII, with coastal gun batteries and searchlights. Now an English Heritage site, it’s right out on a spit, across from the Isle of Wight. We took a small ferry boat to get to it (yes, even our water-hating dog, poor thing). We wandered around the castle for a while, learning some of the history, taking in the sea views, and doing some Easter crafts with E. She even got into playing “princess” with me, which was pretty entertaining. We caught one of the last ferries of the day back to the mainland, and headed back to New Park Manor for dinner. E had her “tea,” then we put the kids to bed, made sure they were asleep, and headed down for our civilized adult dining experience. And it was lovely. A bottle of wine and a three-course meal in a quiet, candlelit atmosphere, how proper of us! The next morning was Easter, so we did Easter baskets from the Easter Bunny in our room for the girls (apparently this isn’t really a thing here), then went down to breakfast. 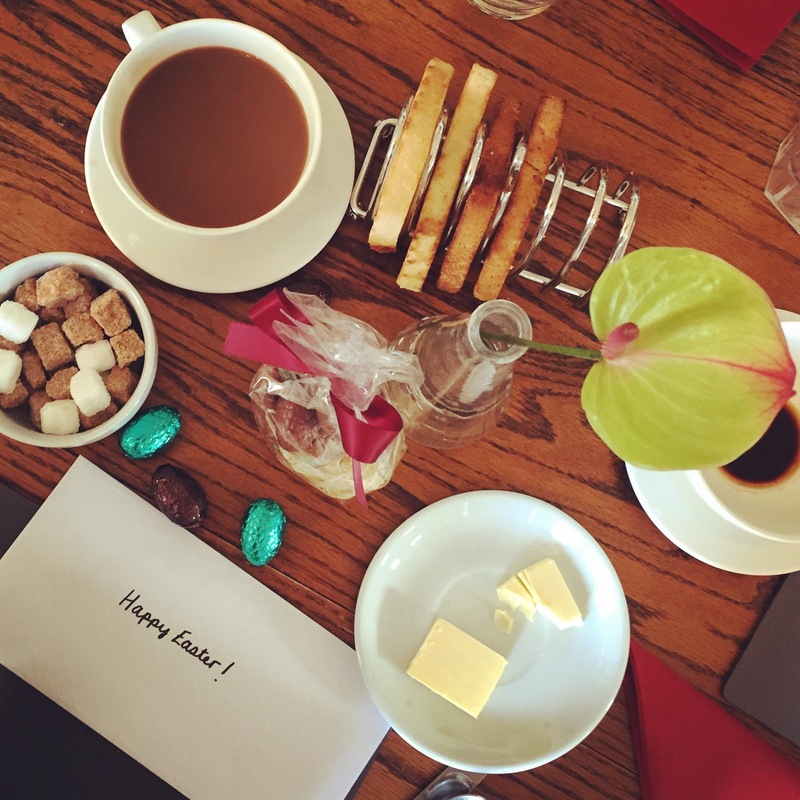 There was a letter from the Easter bunny, along with some chocolate eggs and bunnies, on our table. There was also a special Easter egg trail hunt you could do out in the garden, so we did that after breakfast, along with our own Easter egg hunt. We asked the kitchen to make a picnic lunch for E, and we did a family “hike” into the forest, which was… slow. We didn’t get all that far. And there was quite a bit of whining. Our city kid is not that great at nature, apparently. But you has a sammich, and I has NO sammich! That afternoon I had a massage booked at the spa while the kids were booked into the crèche. I hadn’t been to the spa yet, and that was a big mistake. The spa is amazing. Guests can use the facilities, which include a pool (kids are allowed in this part), a sauna, a steam room, hydrotherapy pools, a therapeutic foot spa, and a “Canadian hot tub” outside on the deck. I did it all. And then took M back with me Monday morning when the kids were at their last crèche session. Sunday night’s dinner was less relaxing than Saturday’s, as R kept waking up crying, so I would have to leave the dinner table and go back to the room. I determined later she has an ear infection, but at the time I didn’t know why she kept waking up and screaming. I got several sympathetic looks from the other parent diners, whom I’m sure were all praying that the next cry wouldn’t come from the baby-listening device on their table. Dinner took several hours that night, and the chef actually completely remade our entrees because the first ones got cold. A big thank you for that! After alternating morning jogs through the forest, breakfast, taking the girls swimming, and then one more trip to the spa during crèche time Monday morning (we really packed it in during our last few hours), it was time to leave. But because our family likes to go out in a blaze of glory and leave ’em wanting more, E threw a massive tantrum right in the lobby, which carried out into the car park as we were loading the car. If you want to know why I said you don’t want to go here if you don’t have kids, there you have it. I don’t care how nice the spa is. We decided to drive around some of the nearby towns and villages to find a pub with a kids’ playground in the garden (this is actually pretty common) for lunch before heading back to London. All in all, it was a lovely holiday weekend in the country, and I am looking forward to our next adventure!